Not long after setting out, at the bottom of Browns Hill. The day before this walk I was at St Johns Point in Donegal, on the coast, in the sunshine. 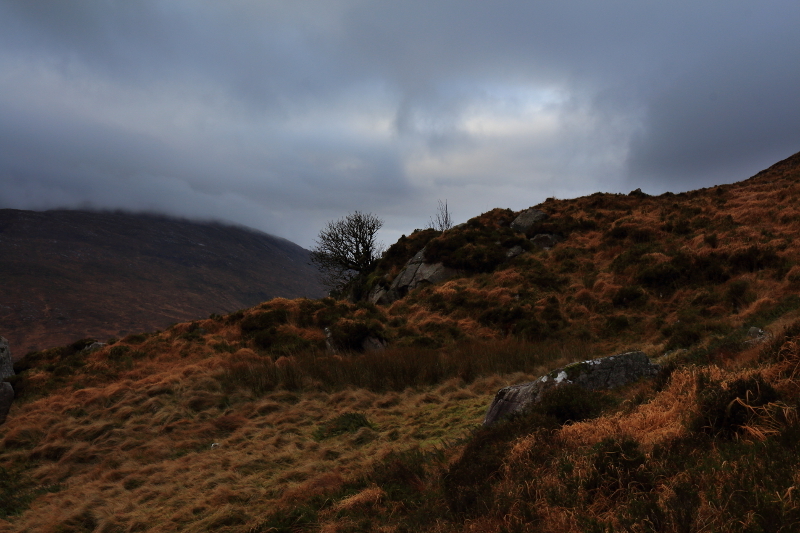 The very next day, despite the grey, wet condtions, I was determined to get out and about again, to make the most of my last day off work, and to get back on the hills to keep building my fitness back up after a period of enforced idleness due to a bad back. Setting out from Barnes Gap, up the forest track, I headed for Browns Hill, leaving the track and crossing the open bog to the foot of the hill. 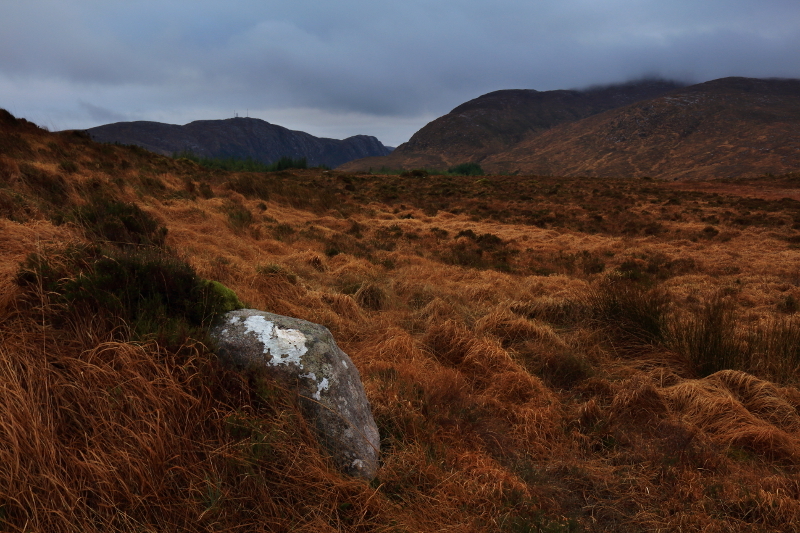 Conditions were grim, with almost constant rain, and the ground underfoot sodden. I tried to convince myself that it might clear up and today might be the day when I continued over Browns Hill and Croaghnageer, to Croaghanirwore which I had not yet stood on. Croaghanirwore was becoming my White Whale, having failed to reach it on a couple of occasions due to the weather, either storms, or snow too deep to struggle through. Unfortunately, the weather got worse as I made my way up the steep 498m high Browns Hill. The rain got heavier and more constant, and the wind became really strong the higher I went. I could hardly get a chance to take the camera out because of the rain, and nearer the top, I often found myself enveloped in cloud anyway, with no visiblity or views. A rare chance to take the camera out. There is a false summit on the way up Browns Hill, and having reached that point, I conceded that I had been thwarted again in my plan to get to Croaghanirwore. 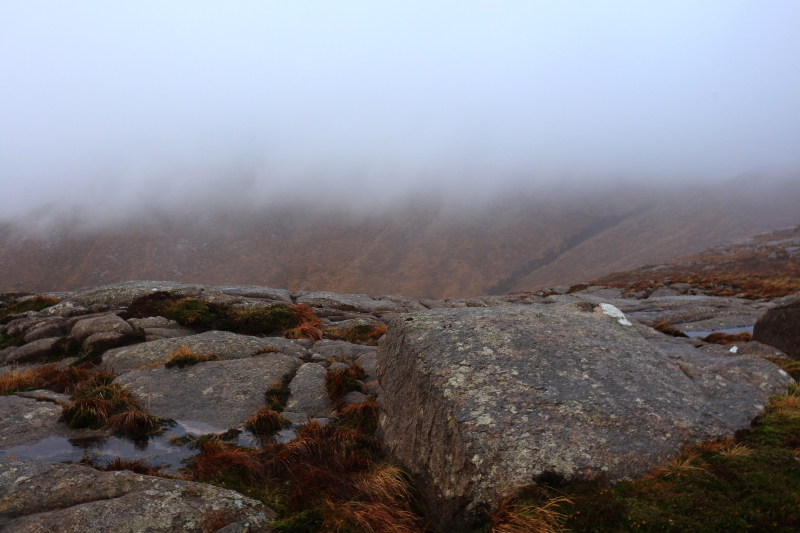 The route would have taken over the summit of Browns Hill, then over Croaghnageer, and both of those summits were hidden in cloud. I had taken a sort of perverse pleasure in being out in such terrible conditions so far, but I felt there would really be little point in continuing when I would be walking in whiteout conditions with no views at all. Looking over to Croaghnageer, hidden in cloud. I was smugly pleased with myself for having ventured out at all in this weather, especially over such wet terrain with no tracks, and felt no guilt at turning back and heading home to get warm and dry. It was nice though, to experience the Bluestacks in all their wild moods! Posted in Landscape, Nature, PhotographyTagged Bluestack, Bluestack Mountains, Bluestacks, Browns Hill, Croaghnageer, Donegal, hill walking, Hillwalking, Ireland, Mountain, mountainsBookmark the permalink. You win some, you lose some! There’s always another time. Exactly Jessica – you have to be philosophical about hill walking in Ireland or it would drive you mad! Oh well. I have to say I love the way wet weather accentuates and deepens colour 🙂 Easy for me to say! Your right Clare, there is a strange pleasure to be had in being out in bad weather, provided you’ve got the right gear on to make it less miserable. It becomes like being in a warm house listening to the rain on the windows.